I didn't post last week. I was too busy out getting photos in and around Atlanta with some photo friends from Maryland. I met Becky at the Promoting Passion Conference in October out in Joshua Tree. She and I have similar interests when it comes to the things we like to shoot. She and her friend, Brenda, left their husbands at home in Maryland while they did a photo adventure drive down to Georgia. Becky had let me know what they were doing, so I put some time aside to go shoot with them. The first place we met up was Old Car City USA on Wednesday morning. I wasn't feeling good Tuesday night. My neck ached, and I had a headache and I felt a little feverish. I don't have time to get sick! And I didn't want to miss this shoot. I'd yet to make it out to Old Car City, even though it's only an hour away. And I wanted to catch up with Becky and meet her friend, Brenda. I pushed fluids and took some ibuprofen during the day on Tuesday. I drank a hot toddy and went to bed early. Wednesday morning, I awoke tired and not feeling great but at least I wasn't aching like the night before. Whatever it was, I kicked it before it turned into anything worse. I drove up to White, Georgia Wednesday morning. I got there a few minutes before Becky and Brenda. I went in for a preliminary look before they arrived. Entering the building at Old Car City, you're hit with the smell of old-garage-musty-red-clay-Georgia-dirt...know what I mean? I walked upstairs first and checked out Dean Lewis' art. His parents owned the place when it was a general store. Mr. Lewis is an artist. His preferred canvas is styrofoam cups. 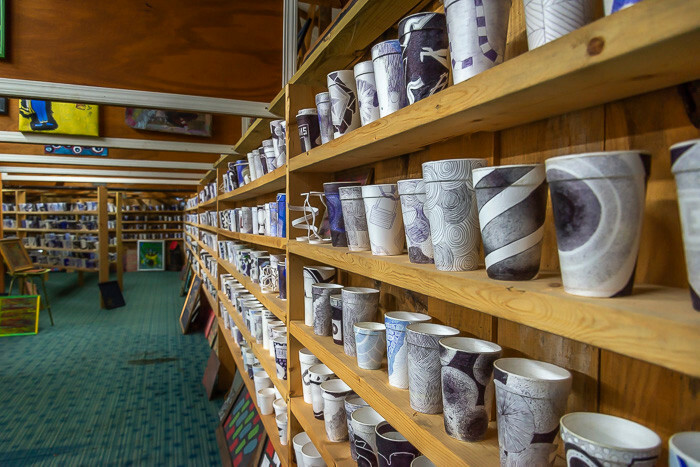 It's amazing what he does with a styrofoam cup. Beautiful. I spent a little time checking out the art and the history of the place. By the time I went back downstairs, Becky and Brenda had arrived. If you go to Old Car City with a camera (including a smartphone camera), it's $25 to get in. It's $15 if you just want to walk around. We paid our money and walked past the little gate. The first thing you see is Elvis Presley's car. It's the last car he bought shortly before his death. As we exited the back of the building, there was a huge collection of old bicycles, tricycles, and kids' wagons with a few old dolls scattered about. The day started out overcast, but not too cold. The light wasn't the best for shooting. But it was perfect for strolling through the over 34 acres of cars. The website says there are over 4,000 cars. I believe it. Everywhere we turned there was something interesting to see and photograph. We were like kids in a candy store with all the textures, colors, and details. I had to change my ISO, shutter speed, and aperture a lot because of the changing light conditions under the trees. There was pine straw covering everything. 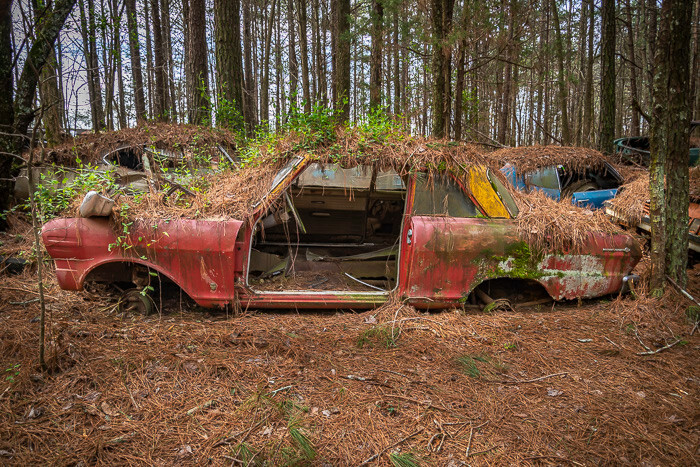 It was as if the earth had birthed the cars and left them sitting. There were plants growing in and around the open doors and hoods and through the smashed windows. Many car roofs were mini gardens of growing plants and trees. I was feeling better, but still a little off. When I'm out getting photos, I do a lot of squatting, bending, and stooping down to get an assortment of angles. As the sun finally showed its face, I felt hot and tired. Usually, I'm energized when I'm out shooting. We walked up and down the aisles and aisles of cars. At one point, I saw a ton of old Ford Mercury cars which reminded me of the awesome David Lindley song Mercury Blues. I had the song in my head for the rest of the day. If you've never heard it, you must! 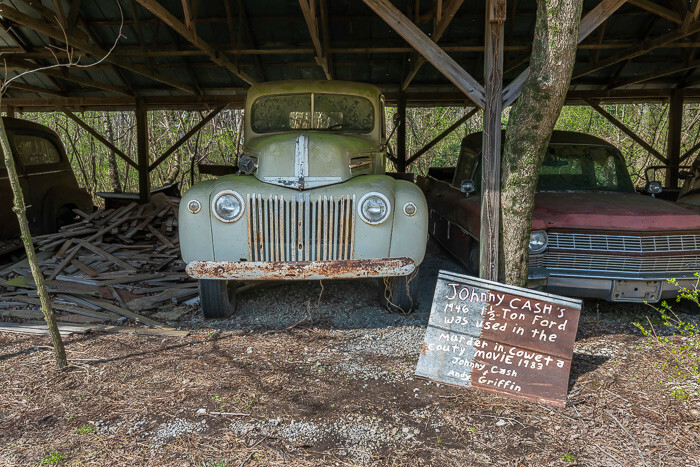 We saw one of Johnny Cash's old cars. It was used in a movie he was in with Andy Griffith. After a few hours, Becky and Brenda were ready for a lunch break, and I was exhausted. We walked back to the entrance. They went to lunch, and I decided to call it a day and come home. I had work to do, and I didn't want to push myself and end up getting sicker. But I was so glad I went. We had a great time. I uploaded my photos when I got home. 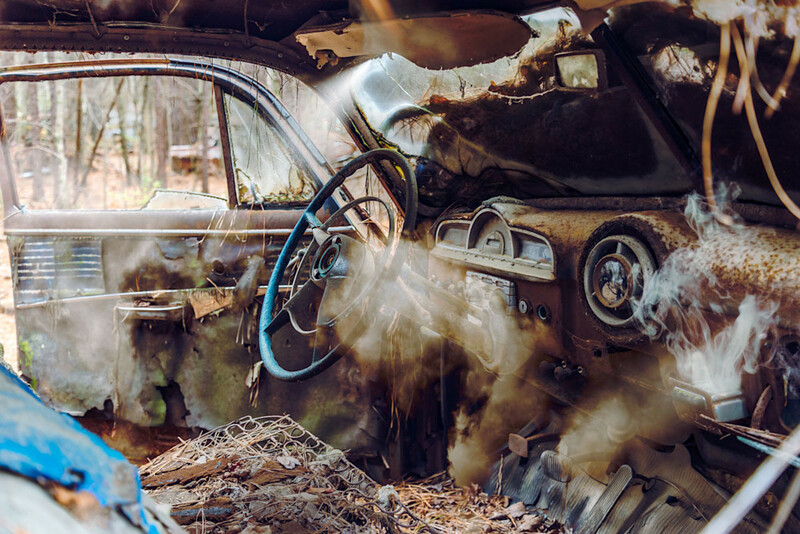 One of my favorites was the photo of the interior of an old car. I was looking at the photo, daydreaming about the car's story. In my imagination, I saw smoke rising from the ashtray. I saw the car driving through the clouds. I started playing with the photo. I added a smoke layer coming from the ashtray. Then I put in some clouds and a sun ray. The composite photo I used for the cover of the blog post is what I ended up with. It's what I saw when I closed my eyes. It's not easy doing this freelance photo and writing gig. I lack regular health insurance. I often find myself working all hours and days. But, a day of shooting and creating makes it all worthwhile.